The Eurogroup (part of which is pictured above) has produced a statement on the outcome of the latest debt talks with Greece. As ever with Eurogroup statements, it confuses more than it enlightens. So here is my attempt at translating Eurogroup-speak into plain English. The Eurogroup welcomes that a full staff-level agreement has been reached between Greece and the institutions. Phew. We got that through before the Brexit referendum. Also, the Eurogroup notes with satisfaction that the Greek authorities and the European institutions have reached an agreement on the contingency fiscal mechanism, which is in line with the Eurogroup statement adopted on 9 May in particular as regard the possible adoption of permanent structural measures, including revenue measures, to be agreed with the institutions. It therefore provides further reassurances that Greece will meet the primary surplus targets of the ESM programme (3.5% of GDP in the medium-term), without prejudice to the obligations of Greece under the SGP and the Fiscal Compact. The Eurogroup also welcomes the adoption by the Greek parliament of most of the agreed prior actions for the first review, notably the adoption of legislation to deliver fiscal parametric measures amounting to 3% of GDP that should allow to meet the fiscal targets in 2018, to open up the market for the sale of loans and to establish the agreed Greek Privatisation and Investment Fund that should operate in full independence. The Eurogroup mandates the EWG to verify in the next few days the full implementation of the outstanding prior actions on the basis of an assessment by the institutions, in particular the corrections to the legislation on the opening up of the market for the sale of loans, and on the pension reform, as well as the completion of all prior actions related to the government pending actions in the field of privatization. Yup, we are sending in the bailout monitors again. They'll soon whip Greece into line. Following the full implementation of all prior actions and subject to the completion of national procedures, the ESM governing bodies are expected to endorse the supplemental MoU and approve the disbursement of the second tranche of the ESM programme. The second tranche under the ESM programme amounting to EUR 10.3 bn will be disbursed to Greece in several disbursements, starting with a first disbursement in June (EUR 7.5 bn) to cover debt servicing needs and to allow a clearance of an initial part of arrears as a means to support the real economy. The subsequent disbursements to be used for arrears clearance and further debt servicing needs will be made after the summer. The disbursements for arrears clearance will be subject to a positive reporting by the European Institutions on the clearance of net arrears. The additional disbursement for debt servicing needs will be subject to milestones related to privatization, including the new Privatization and Investment Fund, bank governance, revenue agency and energy sector to be assessed by the European institutions and verified by the EWG and the ESM Board of Directors. ....but only when we know for certain it has done all that we have agreed. In line with the 9 May Eurogroup statement, and in view of the forthcoming full implementation of all the prior actions by Greece and completion of the first review, the Eurogroup considered today the sustainability of Greek public debt. The Eurogroup agrees to assess debt sustainability with reference to the following benchmark for gross financing needs (GFN): under the baseline scenario, GFN should remain below 15% of GDP during the post programme period for the medium term, and below 20% of GDP thereafter. We will discuss debt relief with a view to doing as little as possible. Preferably, nothing. The Eurogroup recalls the medium-term primary surplus target of 3.5% of GDP as of 2018 and underlines the importance of a fiscal trajectory consistent with the fiscal commitments under the EU framework. Of course, if Greece does "whatever it takes" to achieve that 3.5% primary surplus target, we won't have to offer debt relief. And if it doesn't achieve that target, we can refuse to offer it on the grounds that Greece hasn't done what was agreed. This is looking good. The Eurogroup recalls the following general guiding principles agreed on 9 May for possible additional debt measures: (i) facilitating market access in order to replace over time public financed debt with privately financed debt; (ii) smoothening the repayment profile; (iii) incentivising the country's adjustment process even after the programme ends; and (iv) flexibility to accommodate uncertain GDP growth and interest rate developments in the future. Oh, if only there were more private sector debt. Then we wouldn't have to worry about whether Greece can actually afford the repayments. We could simply impose losses on the private sector like we did in 2012. On 9 May the Eurogroup also reconfirmed that nominal haircuts are excluded, and that all measures taken will be in line with existing EU law and the ESM and EFSF legal frameworks. We want our money back. All of it. Guided by these principles and on the basis of technical work carried out by the EWG, the Eurogroup agreed today on a package of debt measures which will be phased in progressively, as necessary to meet the agreed benchmark on gross financing needs and will be subject to the pre-defined conditionality of the ESM programme. Poul doesn't want to play "let's all agree to an impossible target". But Mutti says we all have to play together nicely. It's not fair. The Eurogroup asks the EFSF and ESM management to take these measures forward within their mandate, on the basis of preparatory work by the EWG, and where needed to prepare formal decision making by the relevant EFSF and ESM decision-making bodies. The decision on the smoothening of the EFSF repayment profile and the reduction of interest rate risks should be taken as a matter of priority. For the medium term, the Eurogroup expects to implement a possible second set of measures following the successful implementation of the ESM programme. These measures will be implemented if an update of the debt sustainability analysis produced by the institutions at the end of the programme shows they are needed to meet the agreed GFN benchmark, subject to a positive assessment from the institutions and the Eurogroup on programme implementatiom. Use of 2014 SMP profits from the ESM segregated account and the restoration of the transfer of ANFA and SMP profits to Greece (as of budget year 2017) to the ESM segregated account as an ESM internal buffer to reduce future gross financing needs. Liability management - early partial repayment of existing official loans to Greece by utilizing unused resources within the ESM programme to reduce interest rate costs and to extend maturities. Due account will be taken of exceptionally high burden of some Member States. If necessary, some targeted EFSF reprofiling (e.g. extension of the weighted average maturities, re-profiling of the EFSF amortization as well as capping and deferral of interest payments) to the extent needed to keep GFN under the agreed benchmark in order to give comfort to the IMF and without incurring any additional costs for former programme countries or to the EFSF. Poul says he means it about debt relief. So to keep him happy, we will talk about debt relief. It's a racing certainty we won't ever have to deliver it. For the long-term, the Eurogroup is confident that the implementation of this agreement on the main features for debt measures, together with a successful implementation of the Greek ESM programme and the fulfilment of the primary surplus targets as mentioned above, will bring Greece's public debt back on a sustainable path over the medium to long run and will facilitate a gradual return to market financing. Debt relief won't be needed. Ever. At the same time, the Eurogroup agrees on a contingency mechanism on debt which would be activated after the ESM programme to ensure debt sustainability in the long run in case a more adverse scenario were to materialize. The Eurogroup would consider the activation of the mechanism provided additional debt measures are needed to meet the GFN benchmark defined above and would be subject to a decision by the Eurogroup confirming that Greece complies with the requirements under the SGP. Such mechanism could entail measures such as a further EFSF reprofiling and capping and deferral of interest payments. 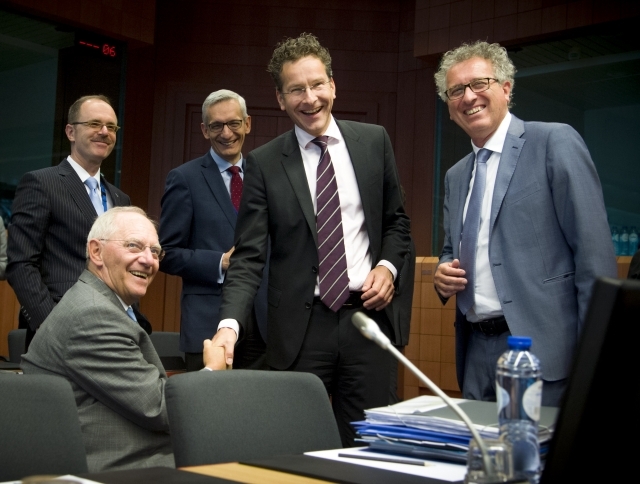 Also, the Eurogroup commits to long-term technical assistance to boost Greek growth. We are going to make damned sure that debt relief won't be needed. The Eurogroup recognises that over the exceptionally long time horizon of assessing debt sustainability there can be no forecasts, only assumptions, given the sizable degree of uncertainty over macroeconomic developments. Anyway, the IMF's forecasting record is abysmal. No-one takes their prognosis seriously. Against the background of the forthcoming successful completion of the first review and the agreement on debt relief, the Eurogroup welcomes the intention of the IMF management to recommend to the Fund's Executive Board to approve a financial arrangement before the end of 2016 that will support the implementation of the agreed fiscal and structural reforms. Poul will play by our rules. Herr Doktor Schaueble has told us so. It is recognised that, consistent with IMF policies, approval of this arrangement will also be based on a new DSA and the assessment of possible debt relief measures mentioned above. The IMF will change its silly estimates to be consistent with our view that Greece can maintain a fiscal surplus of at least 3.5% forever. The possible debt relief will be delivered at the end of the programme in mid-2018 and the scope will be determined by the Eurogroup on the basis of a revised DSA in cooperation with the European Institutions for purposes of taking into account the European policy framework, subject to full implementation of the programme. The Germans want us to delay any further discussion of debt relief until after their elections. By that time Greece will have delivered the 3.5% primary surplus anyway, so we won't need to discuss it. And if it hasn't, we still won't need to discuss it. The Eurogroup stands ready, in line with usual practice, to support the completion of future reviews provided that the policy package considered today, including the contingency mechanism, is implemented as planned. The Eurogroup confirms that programme implementation, as well as policy conditionality and targets, will be reviewed regularly based on input from the institutions. Did we mention that Greece must deliver that 3.5% primary surplus? Image courtesy of the EU press office. I assume that the bullet point called Liability management means that ESM resources will be used to buy the IMF out. Ah yes, missed that. I will add an annotation to that effect. Well spotted. Doesn't Greece technically need to get that 3.5% surplus from somwhere? Given that Greece has not been a net exporter or goods and services in at least 60 years (I can only find stats from 1955 onwards). Unless they start taxing financial wealth, where's that surplus going to come? Has any country been able to run a government surplus like that continously? I remember surpluses just before the big debt bubble but that wasn't many years. It would not surprise me if net EU subsidies to Greece totalled around 3.5% of GDP. Those subsidies being made up of farm subsidies, Regional Development Aid, universities, convergence funding and many others ( names may be incorrect, but you get the idea ). So in effect taking out the net handouts the Greek government is being asked to run a balanced budget. Seems subsidies are around 2,4% of GDP for Greece. net subsidies to Greece were ridiculously high as a % of GDP in the 80s and 90s. That is surely going to create a rent seeking culture, and take away incentives to get on in the world by being competitive. When is this going to blow up, Frances? How long can they kick it down the road? And why will it blow up? Because of the economics or because the people of Greece will simply have enough and kick back?